This year sees an updated programme of learning activities on offer at Canterbury Museums & Galleries, including a new Roald Dahl workshop. New activities and workshops include The BFG in Pictures, Ancient Greeks, Habitats and Environments and Hands on History of Canterbury. Other new workshops expected to be available from February are Anglo Saxons and Vikings and World War Two. Information on these will be announced shortly. The BFG workshop will coincide with the opening of a new exhibition. 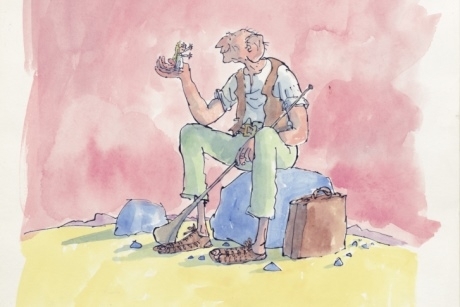 The BFG in Pictures is an exhibition from House of Illustration, co-curated by Quentin Blake and Claudia Zeff. The workshop, available between 3rd March and 20th May, allows students to explore The BFG in Pictures exhibition which highlights some of the illustrations from the story and other artwork. The session will be in two parts; the first part is a tour of the exhibition where pupils will be encouraged to explore the illustrations and stories on display and share ideas. These ideas will be explored in a creative writing and making session in the museum’s Learning Lab. This new workshop will cater for up to 32 students. Larger groups will be split up and rotated through activities. The session is suitable for Key Stage 1 to 3. What other workshops are new? Schools can choose from a range of activities to enjoy and learn from during the Ancient Greeks workshop, alongside handling real Ancient Greek objects. Pupils will investigate and identify artefacts and create an archaeologists record; categorise the artefacts - presenting the data in tallies and charts; create an Ancient Greek frieze; explore The Beaney through the eyes of the Greeks and see how the world has continued to be influenced by their thinking through the ages. This workshop is suitable for Key Stage 2 and 3 classes. For Key Stage 1 and 2, the Habitats and Environments sessions will let students look at the museum’s animal specimens and artefacts and find out the stories behind them. This is a facilitated workshop that guides pupils around the museum exhibits, featuring some of the more unusual items on show. Pupils will also take part in a habitats themed creative activity. Hands on History of Canterbury is a workshop that involves an object handling session enabling pupils to examine genuine artefacts and choose from a range of activities to uncover information and dates for the artefacts, just like real archaeologists. It is suitable for Key Stage 1 to 3 groups. For more information, visit canterburymuseums.co.uk/schools. Image: Cover artwork for 'The BFG' (Jonathan Cape, 1982) © Quentin Blake. A new exhibition at London’s Science Museum will explore what the future holds for driving technology. The new exhibition in London Waterloo, now on until June 2019, will see students educated on Nelson Mandela’s journey from childhood to becoming South Africa’s first black president.